Have an idea for a structure of your own? Please feel free to email or call. make arrangements to stop by the workshop! Take the Mukilteo-Clinton Ferry to Whidbey Island. At the third light, turn Left on Bayview Road. a large galvanized building on your left. up the hill to a large galvanized building on your left. Whidbey is a rustic, charming island just 30 miles north of Seattle. Catch the ferry and come enjoy a day away from the bustle of the city. Our slow paced life here is a welcome retreat, and you'll be glad you visited! 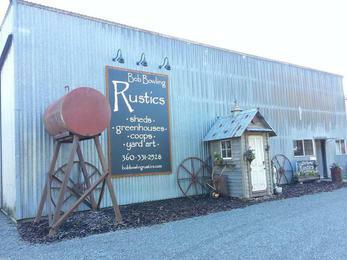 Stop by the Bob Bowling Rustics workshop on Whidbey Island!